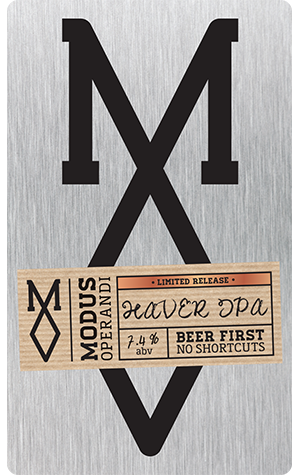 While they make tight beers across plenty of styles, Modus Operandi has undoubtedly built much of its fame from its hoppy beers. The recent announcement that they had retired their former trophy-winning IPA, Zoo Feeder, from the core range was met with disappointment by many, but the good news for lovers of Modus’ big hop bombs is that they’ve barely managed to go two weeks before releasing another one. This new beer has been brewed in collaboration with the team from The Dutch Trading Co., some of whom made the trip across the continent for brew day. The idea was to make the most of MO brewer Dennis de Boer’s knack for hops while adding something a bit different to what they’d done before. In this case it was oats – hence the name, Haver, which apparently means ‘oats’ in Dutch – to give a more fulsome body and creamy mouthfeel. That it most certainly does, while a big dose of dry hopping with US varieties brings out ample tropical aromas on top of a firm but typically balanced bitterness. Provided they keep putting out IPAs like this, no one should mind too much that Zoo Feeder made that early retirement.